Massive indebtedness changes a person, maybe even more than a college education does, and it’s reasonable to suspect that the politicos who have allowed the tuition disaster to take its course know this. 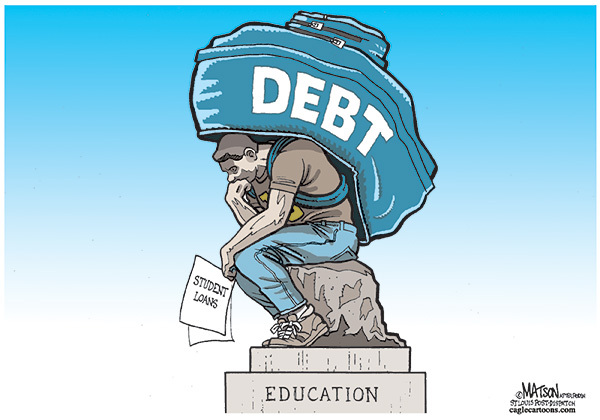 To saddle young people with enormous, inescapable debt – total student debt is now more than one trillion dollars – is ultimately to transform them into profit-maximizing machines. I mean, working as a schoolteacher or an editorial assistant at a publishing house isn’t going to help you chip away at that forty grand you owe. You can’t get out of it by bankruptcy, either. And our political leaders, lost in a fantasy of punitive individualism, certainly won’t propose the bailout measures they could take to rescue the young from the crushing burden. What will happen to the young debtors instead is that they will become Homo economicus, whether or not they studied that noble creature. David Graeber, the anthropologist who wrote the soon-to-be-classic Debt: The First 5,000 Years, likens the process to a horror movie, in which the zombies or the vampires attack the humans as a kind of recruitment policy. “They turn you into one of them,” as Graeber told me. The story hit home for me, because I, too, wanted to be a professor once. I remember the waves of enlightenment that washed over me in my first few years in college, the ecstasy of finally beginning to understand what moved human affairs this way or that, the exciting sense of a generation arriving at a shared sensibility. Oh, I might have gone on doing that kind of work forever, whether or not it made me rich, if journalism had not intervened. It’s hard to find that kind of ecstasy among the current crop of college graduates. The sensibility shared by their generation seems to revolve around student debt, which has been clamped onto them like some sort of interest-bearing iron maiden. They’ve been screwed – that’s what their moment of enlightenment has taught them.